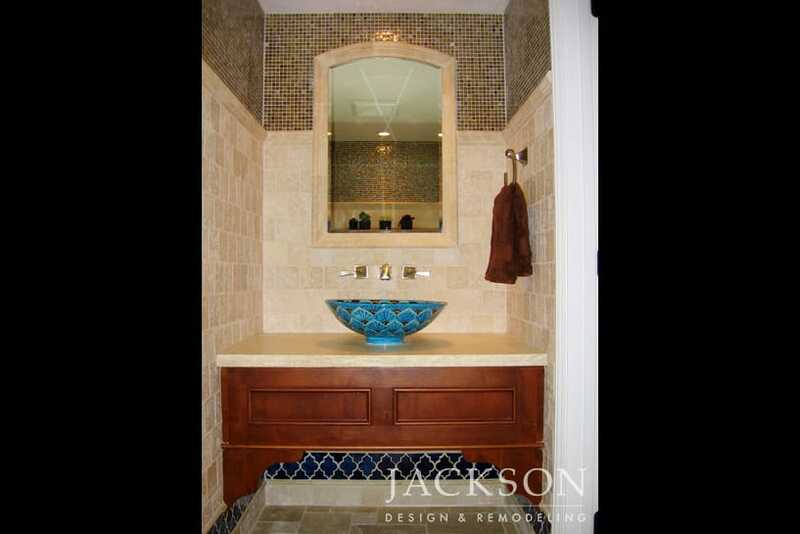 A traditional environment requires respect for classic aesthetics when designing new traditional bathrooms. 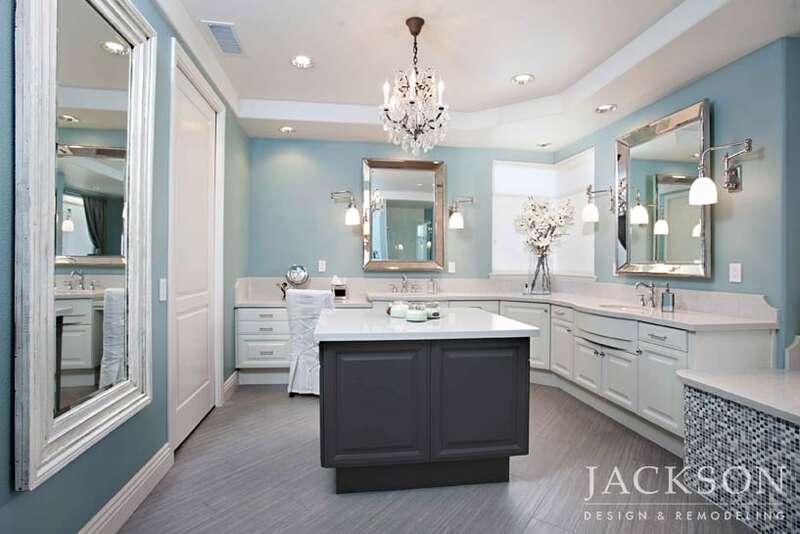 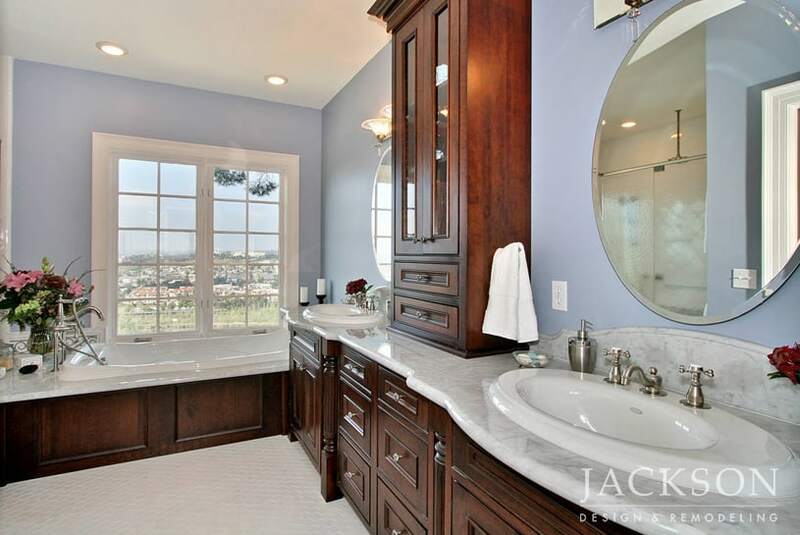 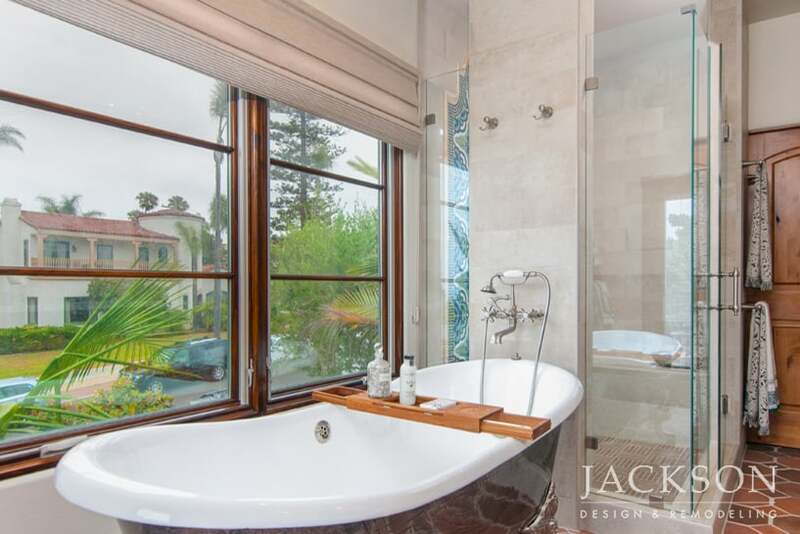 Our design team has the expertise to create a luxurious San Diego traditional bathroom with all the modern amenities that feels as if it has always belonged in your traditional home. 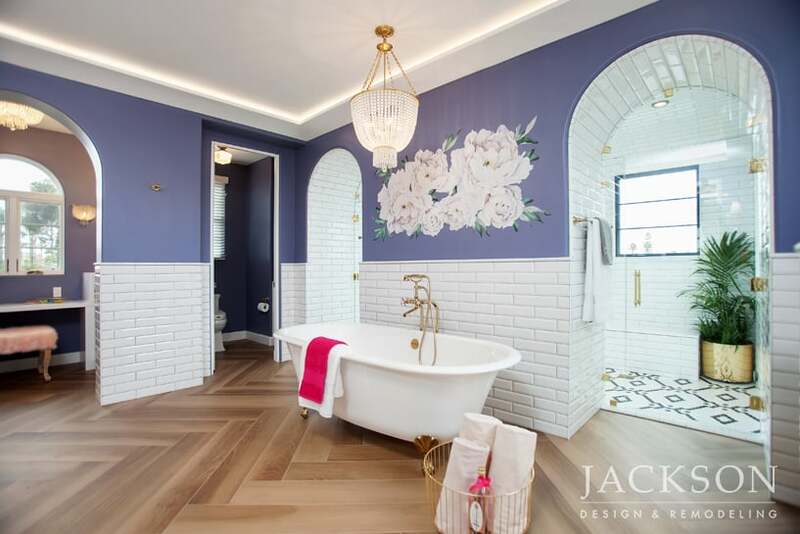 Illuminated by a glittering chandelier, the tub in this glamorous master bathroom is an oasis of relaxation under a wall mural of blooming flowers. 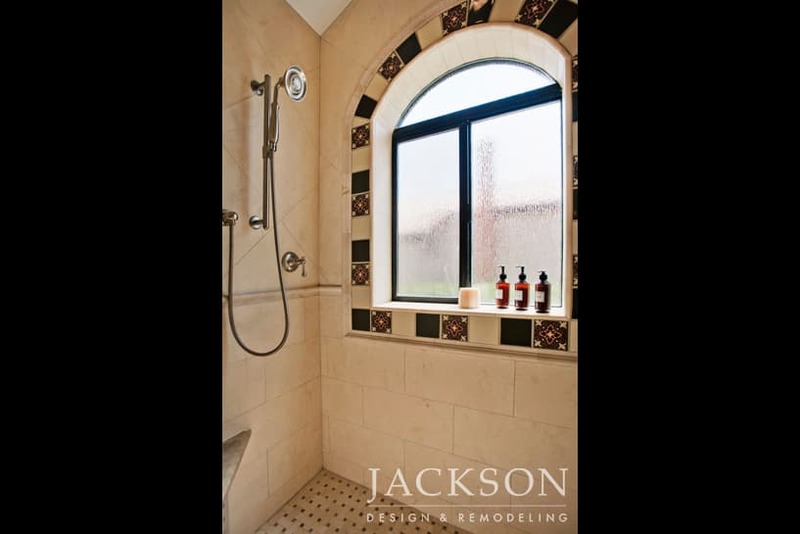 Dual arches lead into a shower for two with views of gorgeous natural surroundings. 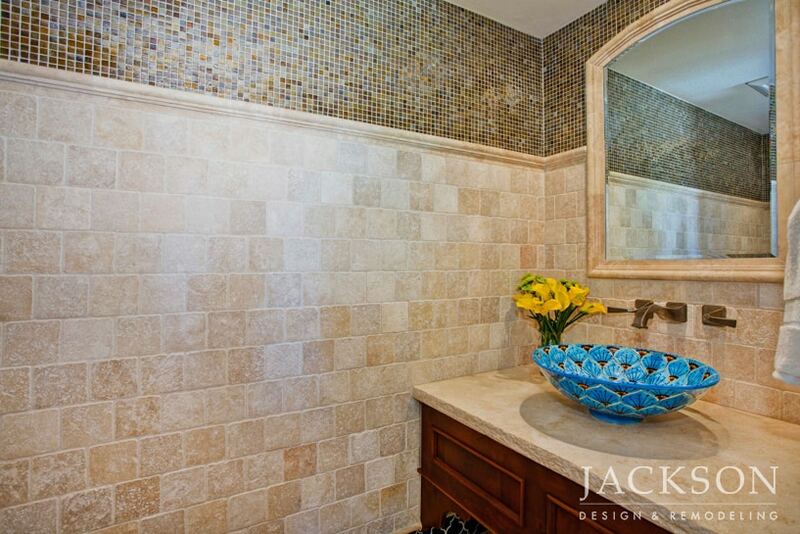 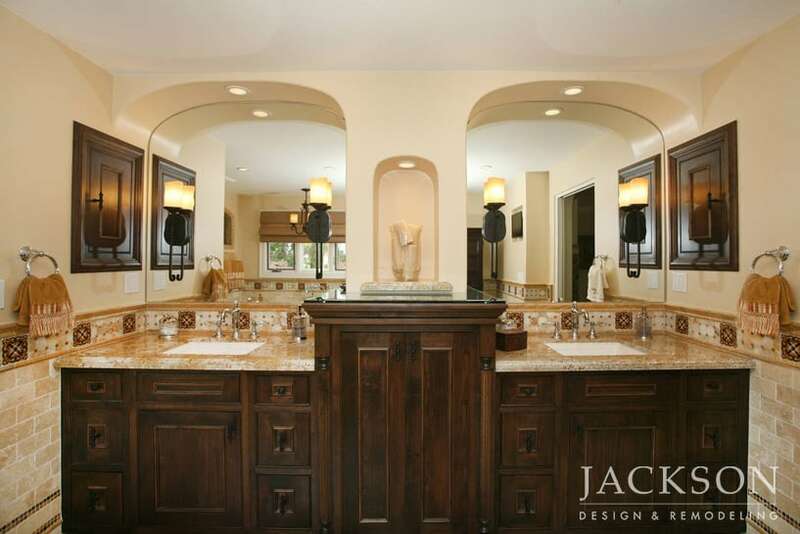 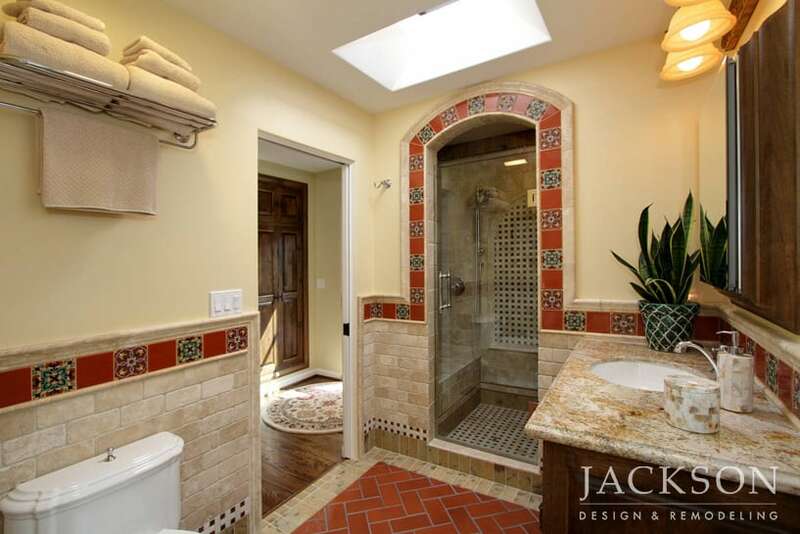 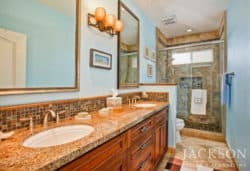 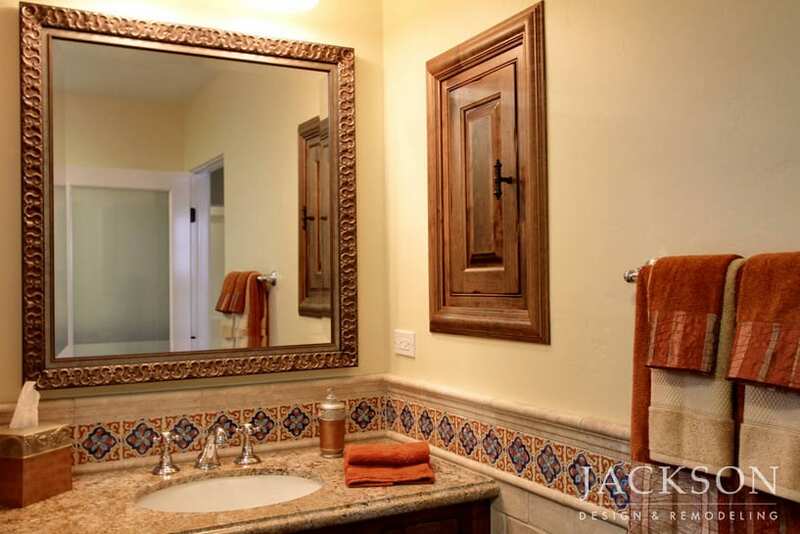 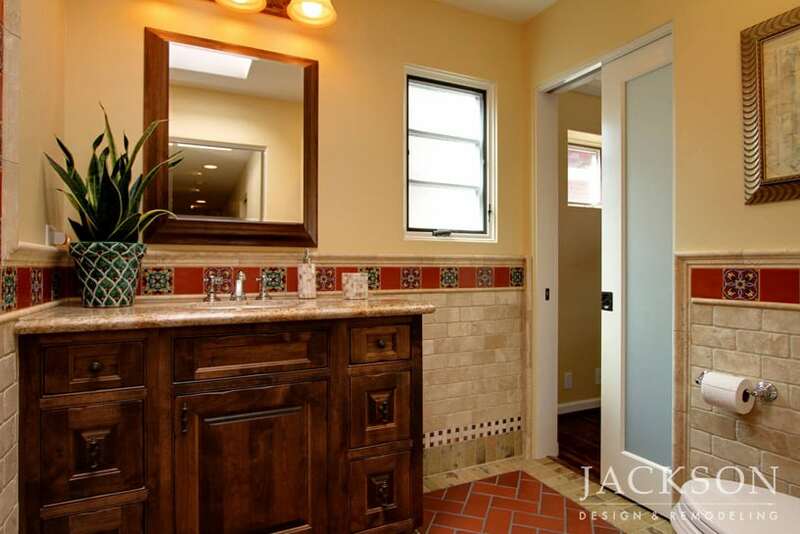 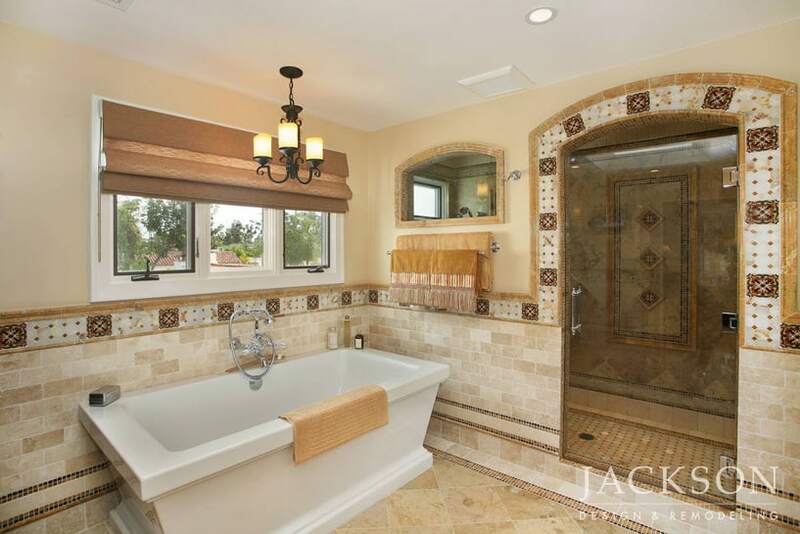 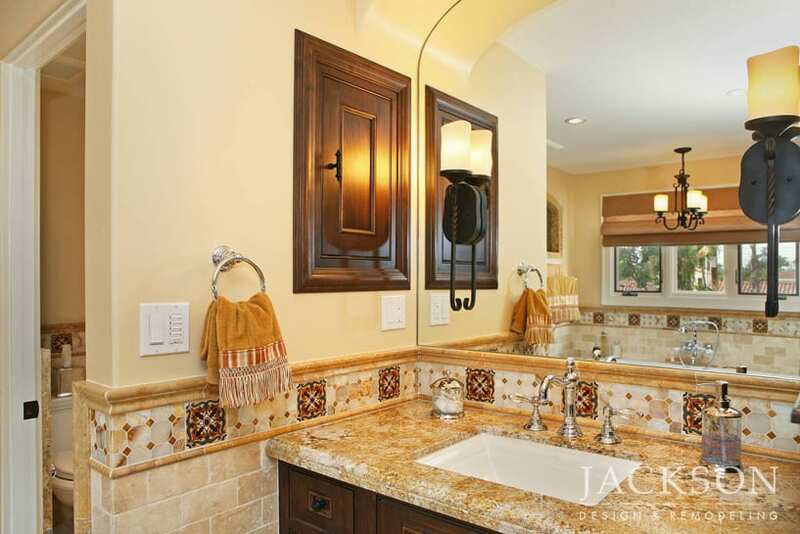 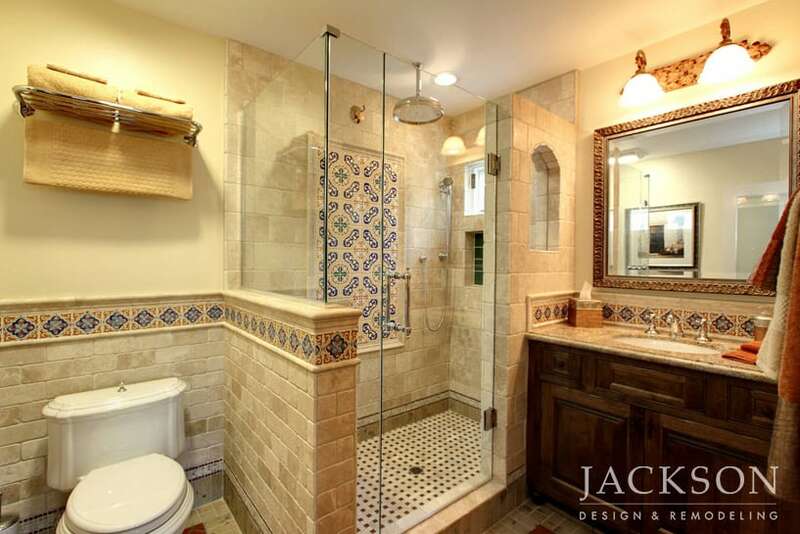 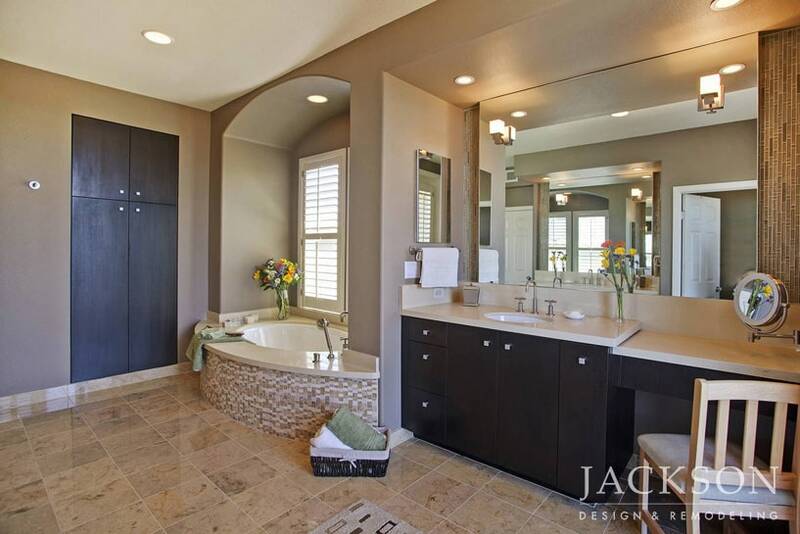 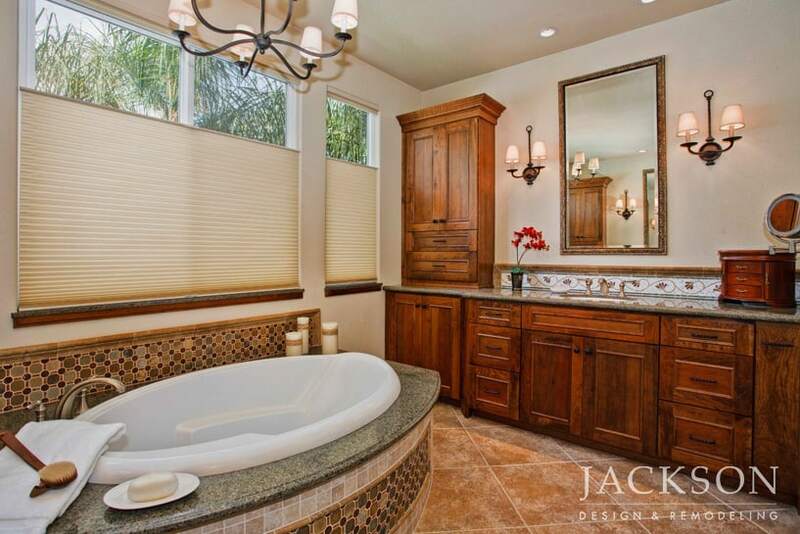 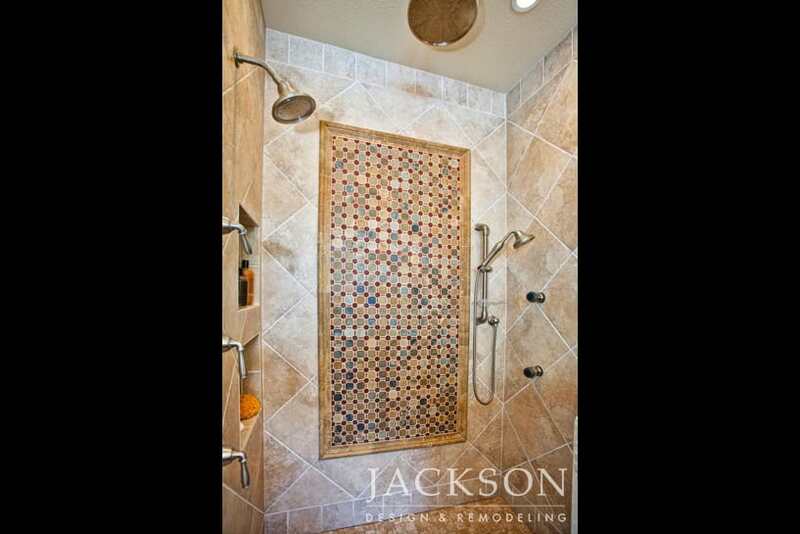 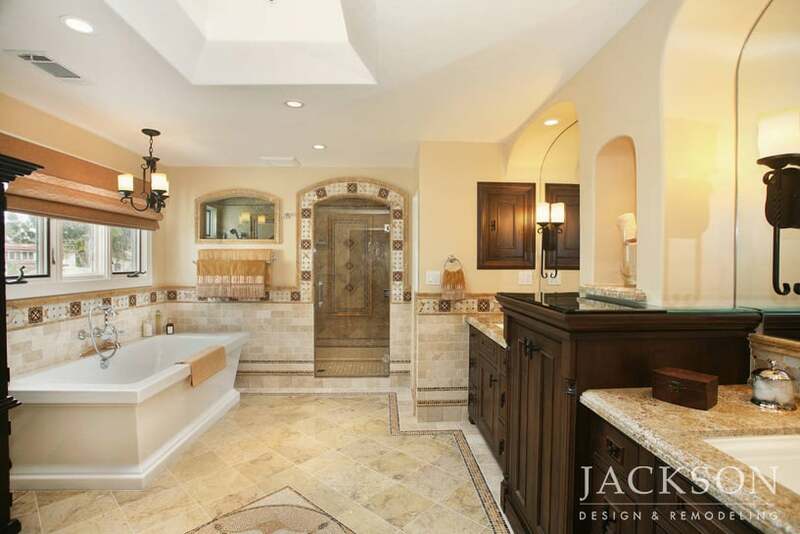 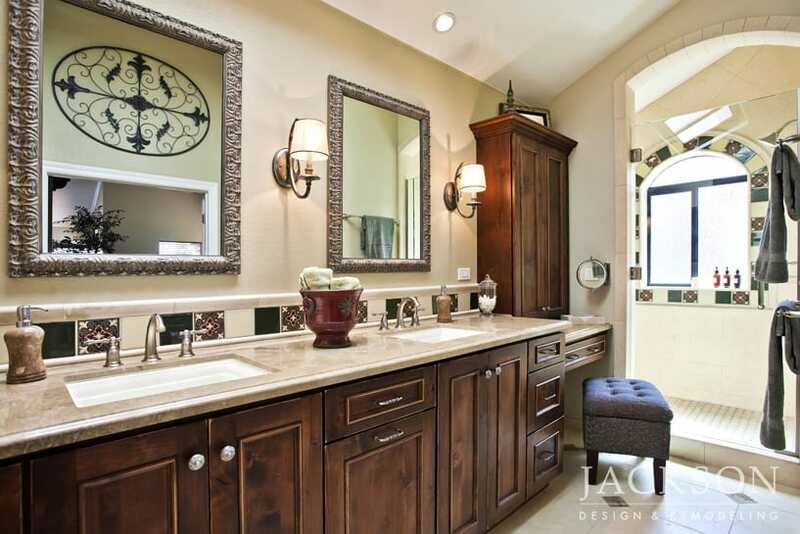 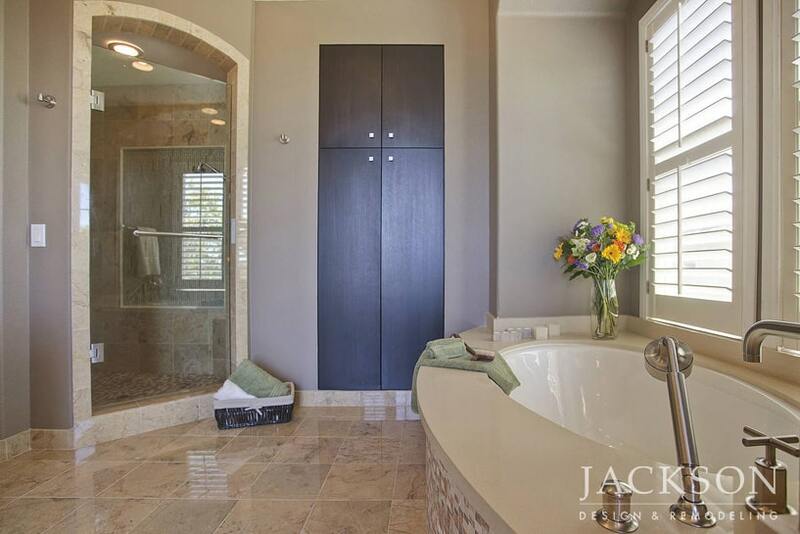 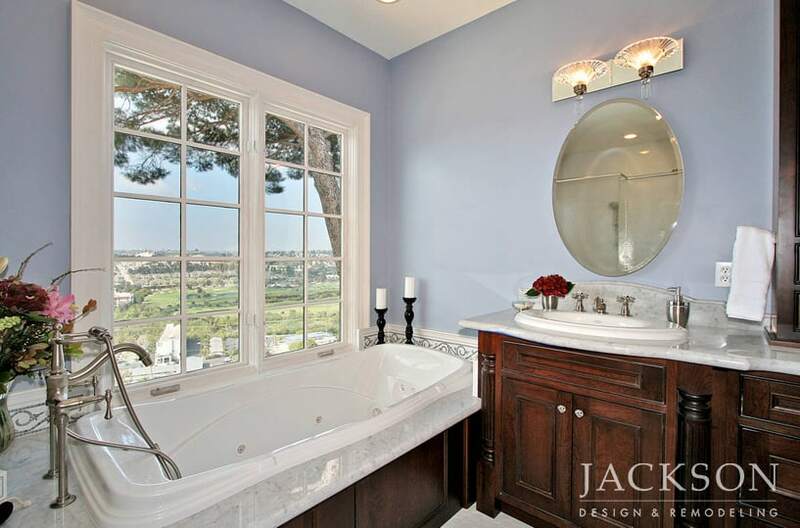 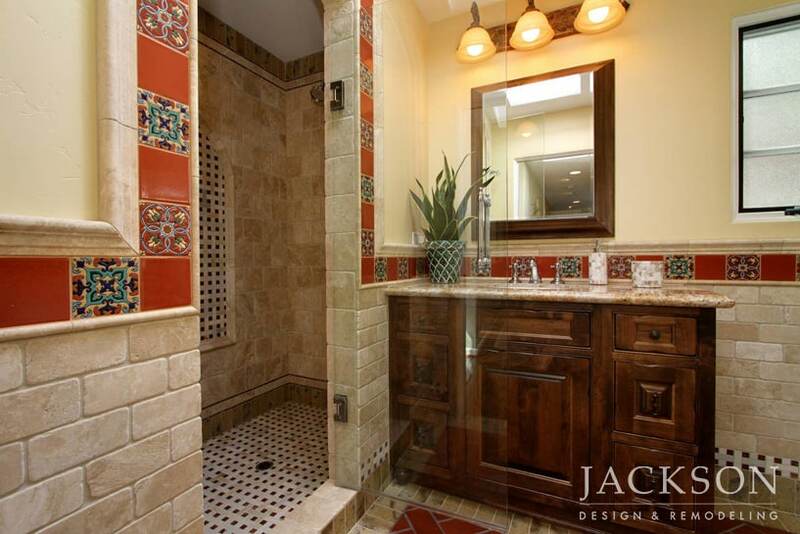 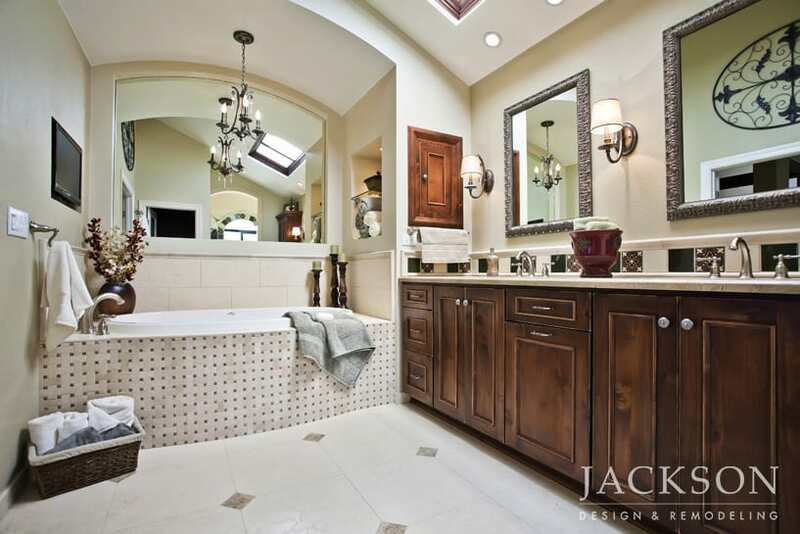 A couple with young children wanted a spacious master bathroom in their Spanish style home as a relaxing retreat. 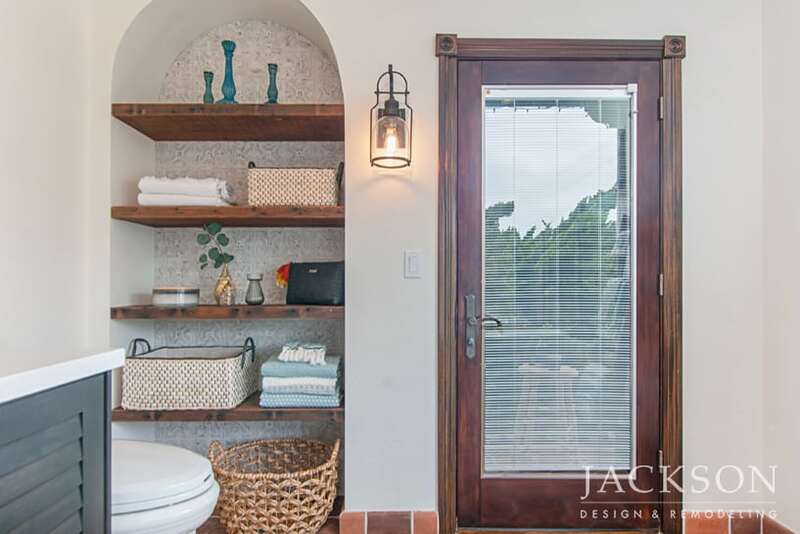 The new design honors the home’s character while blending rustic and modern elements, including a 350 lb. 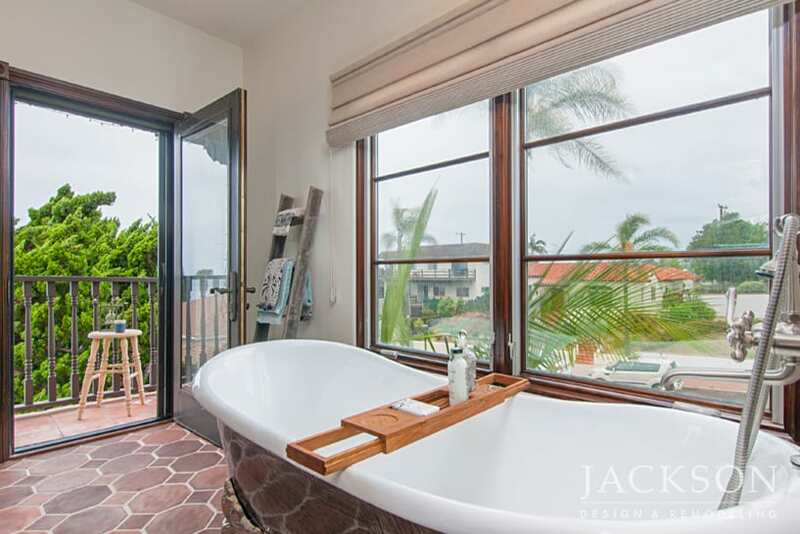 cast iron tub with a view. 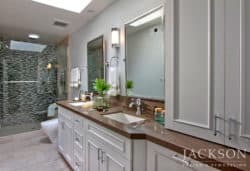 In the California coastal home of Maryland natives, the clients wanted a master bath that evoked the charm of East Coast colonials with modern functionality. 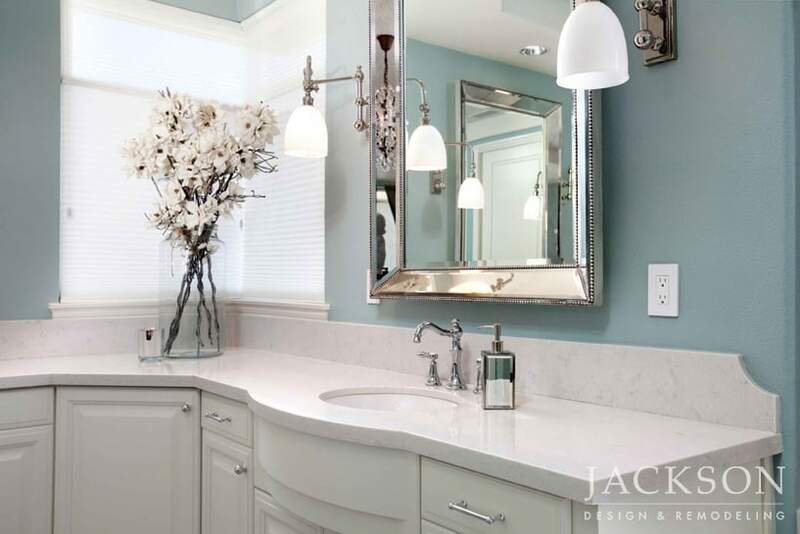 Hues of white and blue lend the room a fresh serenity. The owners of a historic Spanish Revival home wanted a grand master bathroom as a respite from their busy lifestyles. 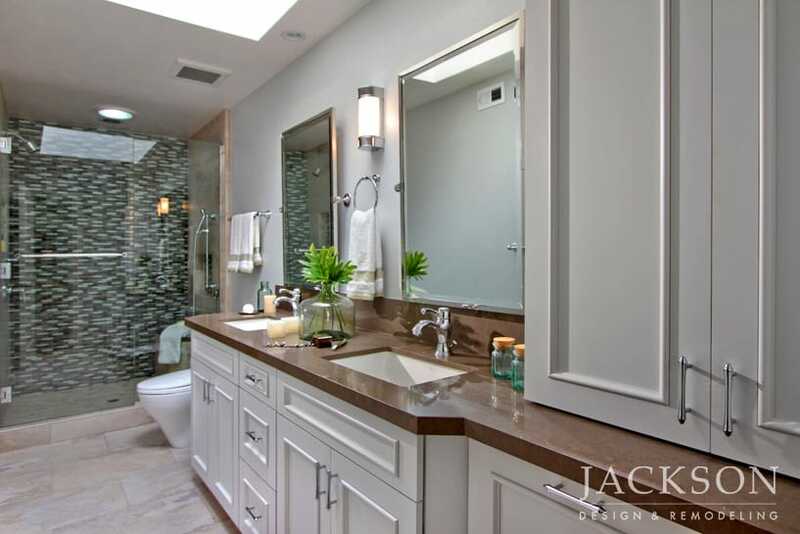 This award-winning bathroom aligns with the homes original character while adding modern function and convenience. 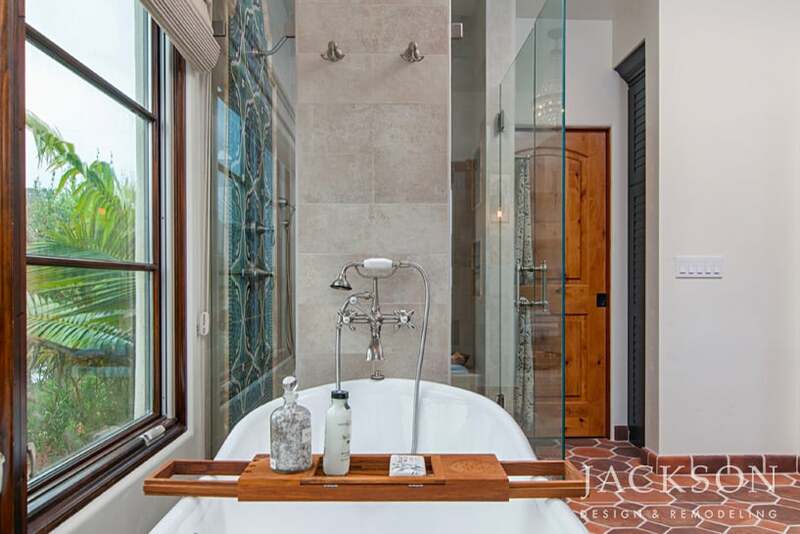 This serene and glamorous retreat is imbued with subtle luxury. 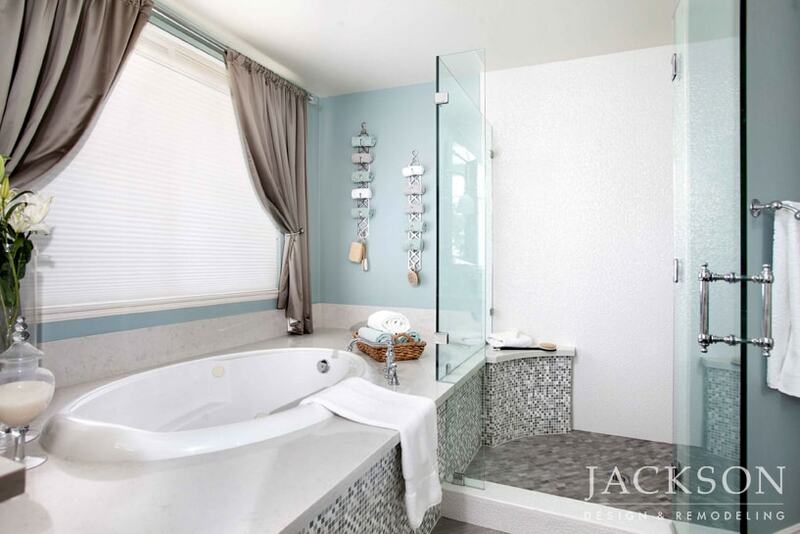 Ample natural light and views that capture beautiful natural surroundings make the space feel open and comfortable, especially when relaxing in the generous free standing tub. 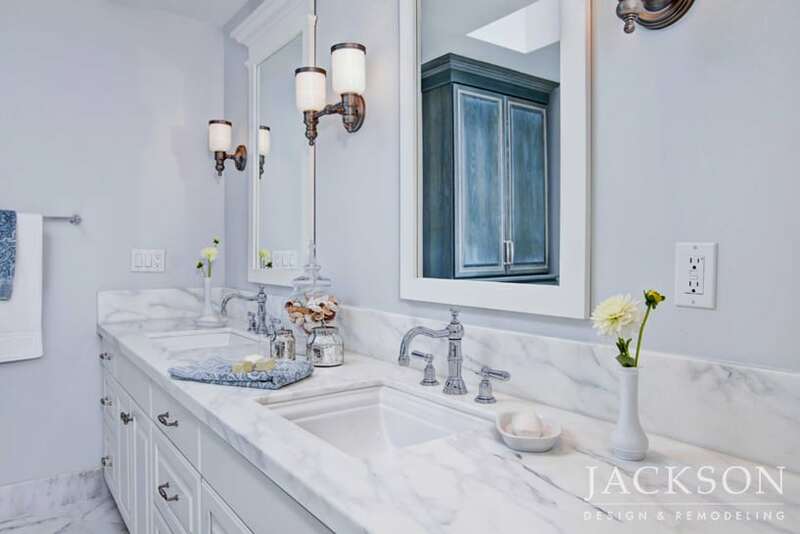 The substantial, elegant materials in this master bathroom are a sophisticated reflection of the historic home’s period style in an award-winning whole home remodel. 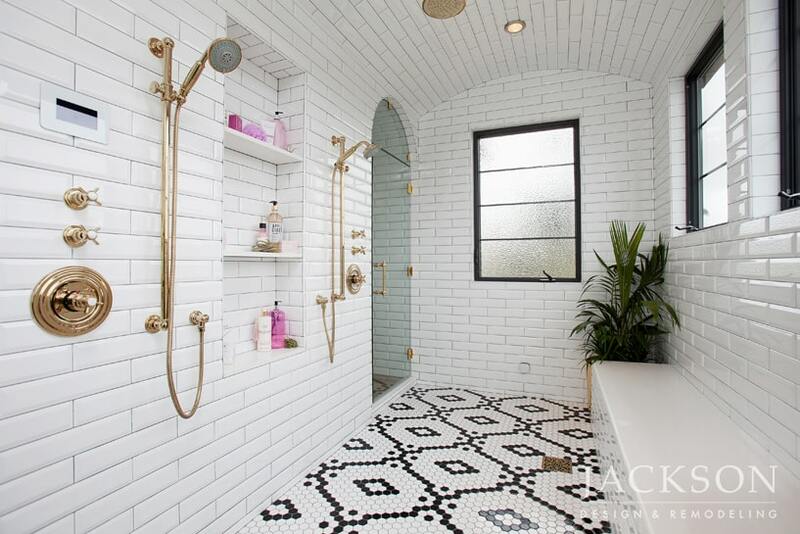 The aesthetic honors history while satisfying the need for modern convenience. 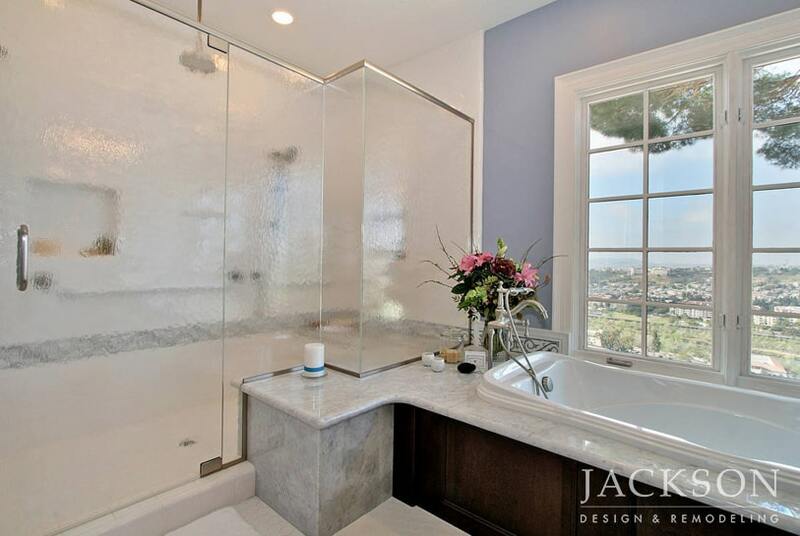 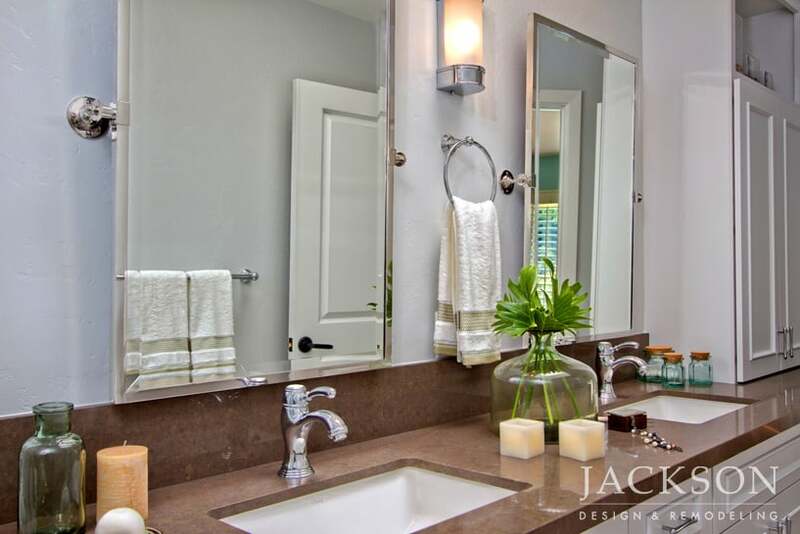 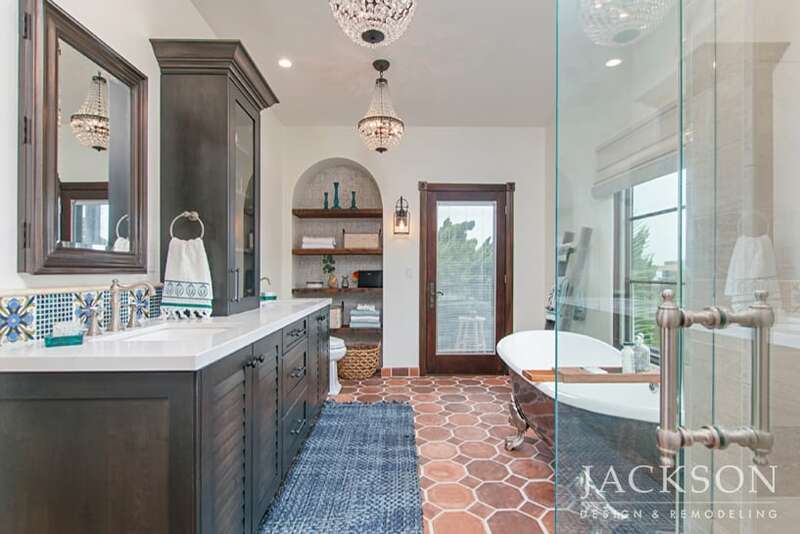 For their home with stunning ocean views, these clients wanted a master bathroom that would embody the home’s original character while attaining a new level of luxury. 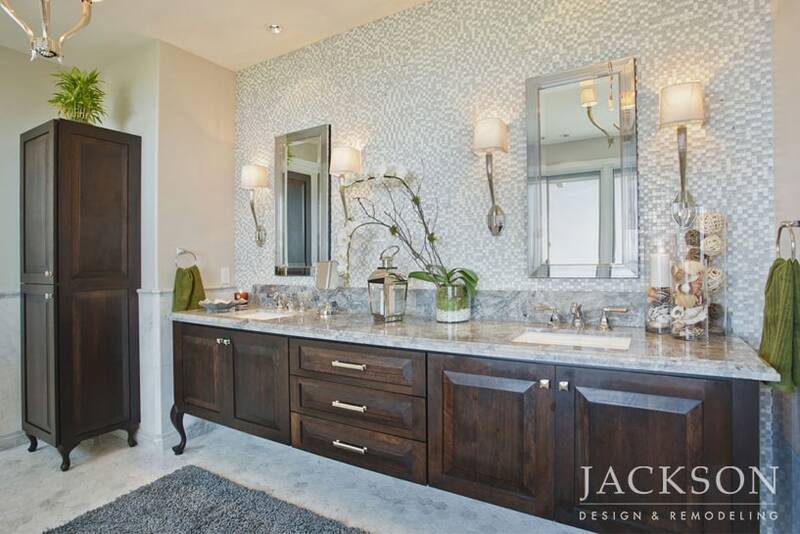 This award-winning design blends traditional romance and modern glamour. 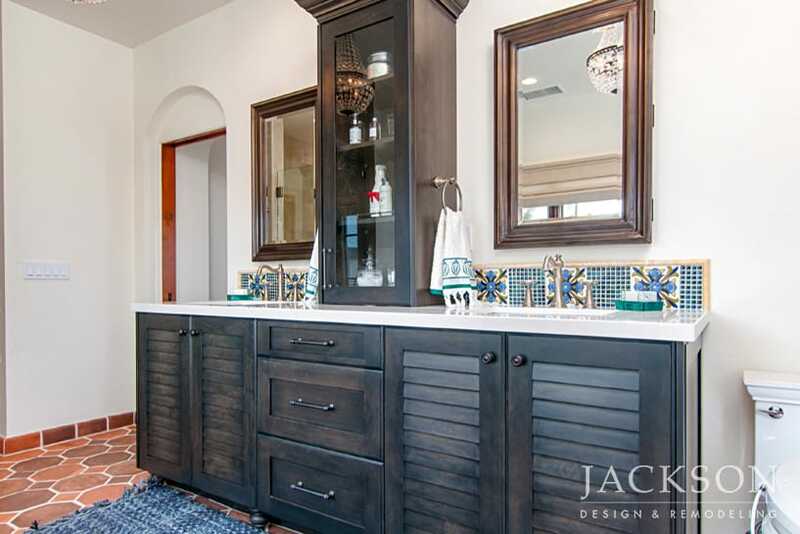 Bold lines and dramatic scale make this expansive master bathroom a rejuvenating retreat. 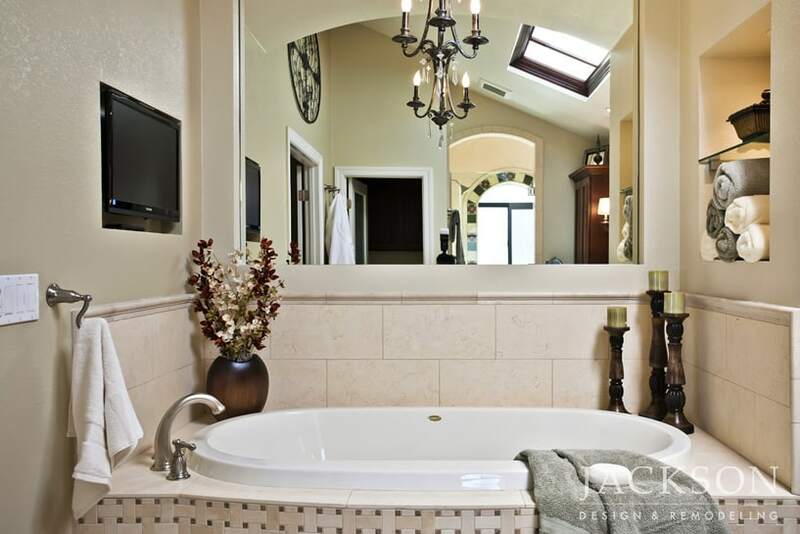 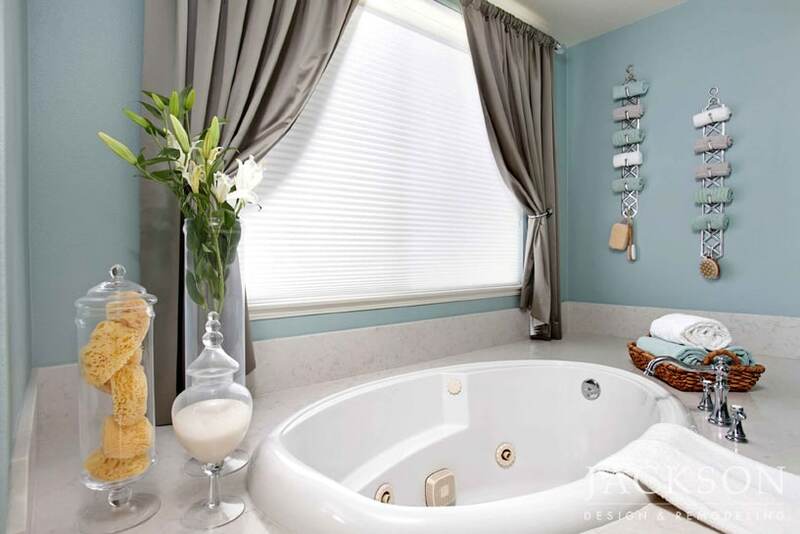 Central to the design, a luxurious tub invites lengthy baths. 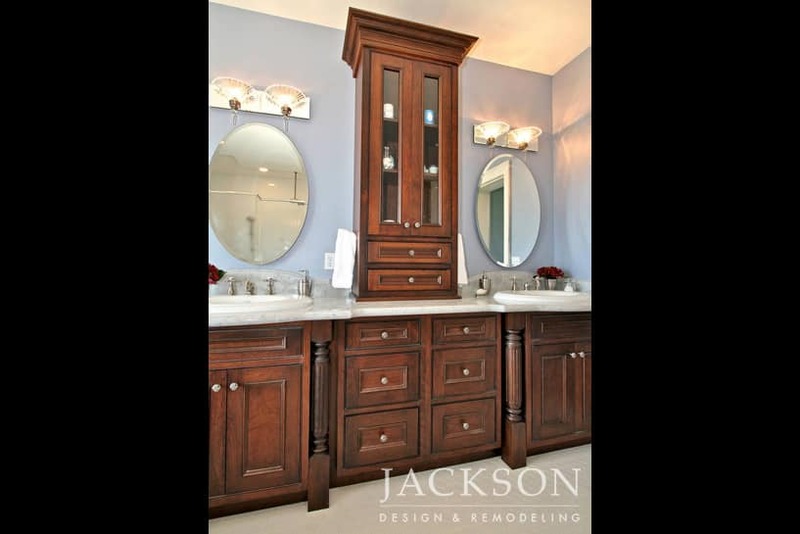 Dark cherry cabinets balance with muted creamy tones and intricate tile work. 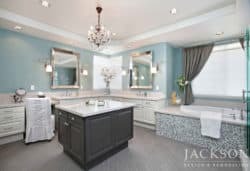 Crisp white, serene blue and shimmering silver create an elegant color palette in this pristine master bathroom with a luxurious tub, shower and vanity area. 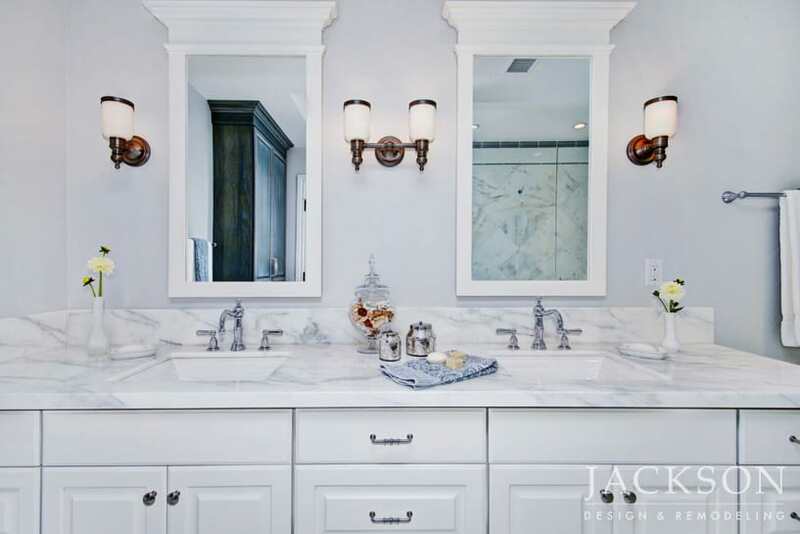 Romantic femininity is emphasized with ornate oversized mirrors and a glittering chandelier, which lights the space with a flattering glow. 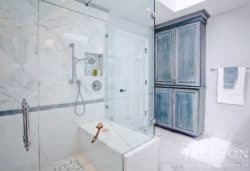 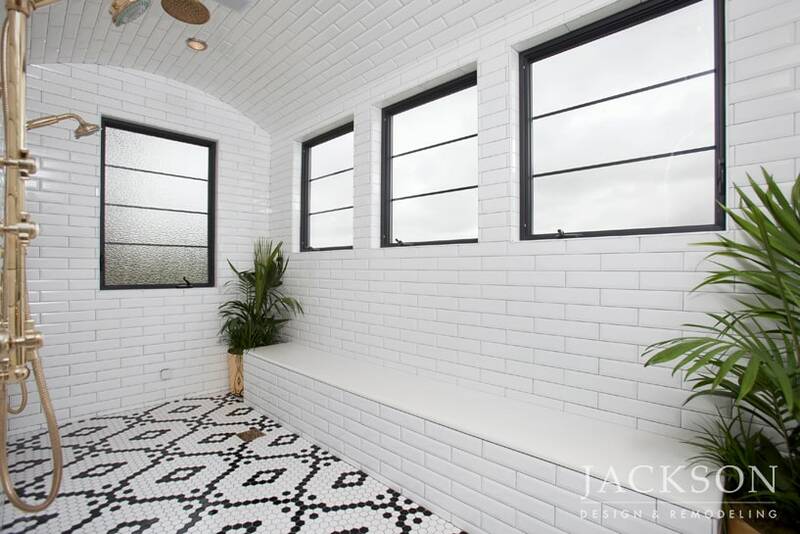 In a bathroom filled with natural light from a generous skylight, white surfaces contrast with a wall of glistening tile in the spa-like shower. 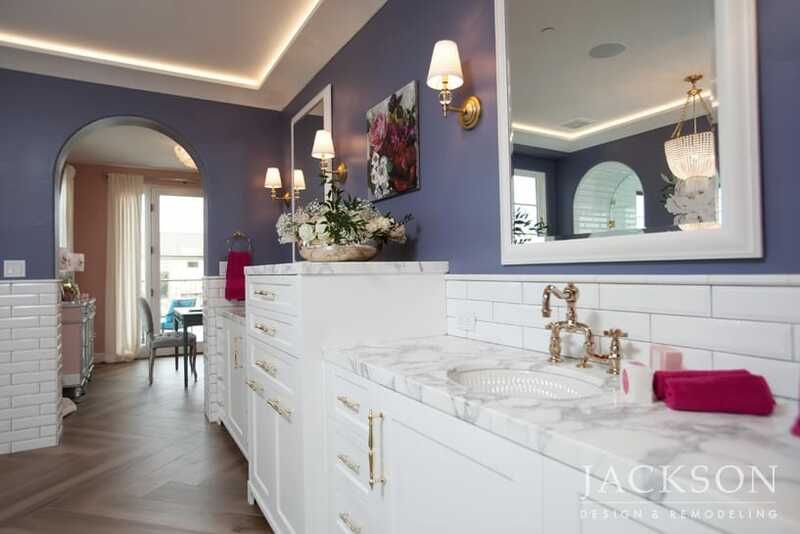 Traditional white cabinetry provides an abundance of storage. 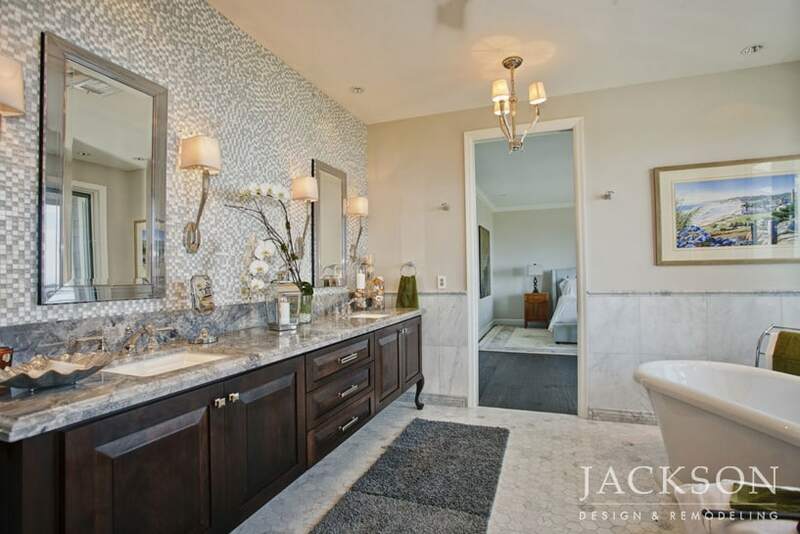 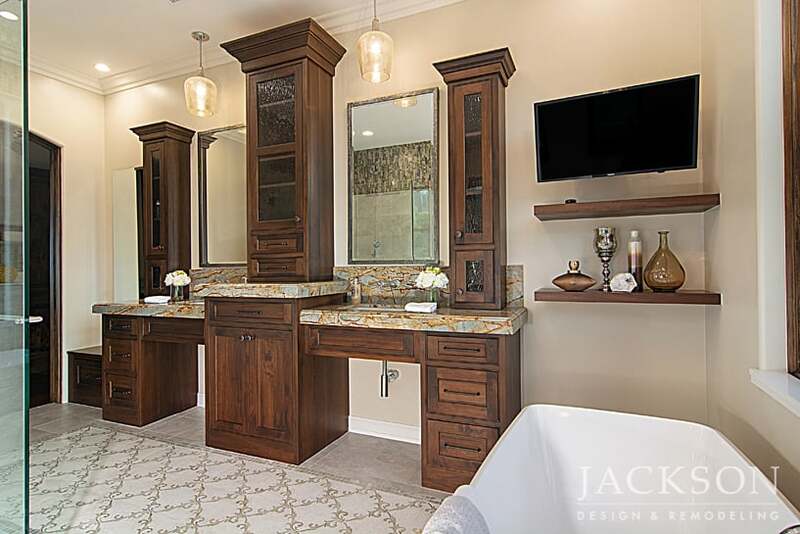 A light filled oasis, this generously sized master bathroom was designed to easily share and to celebrate the beauty of its natural surroundings. 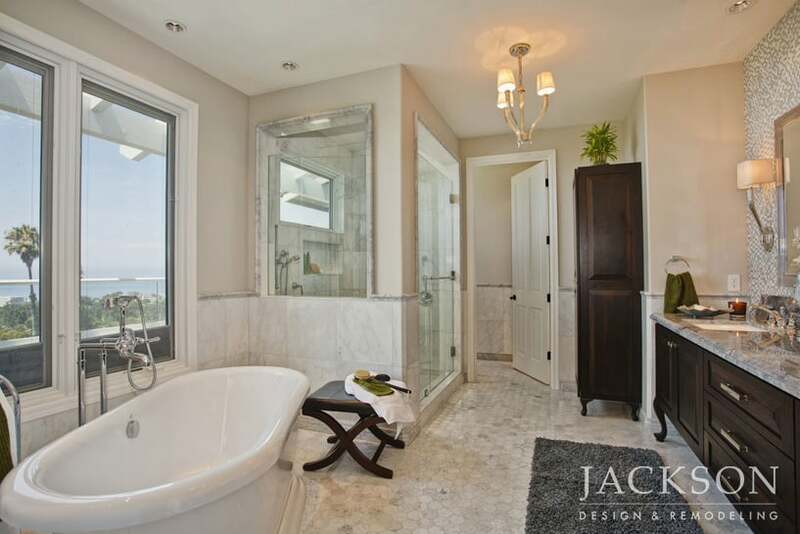 An immense bath with spa-like amenities invites bathing with stunning views. 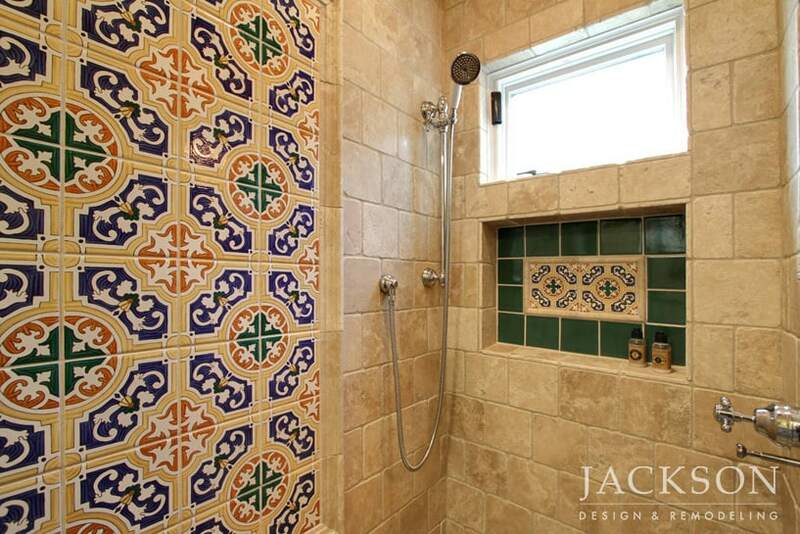 Gorgeous hand-painted tile work adorns this guest bathroom in a Spanish Revival home. 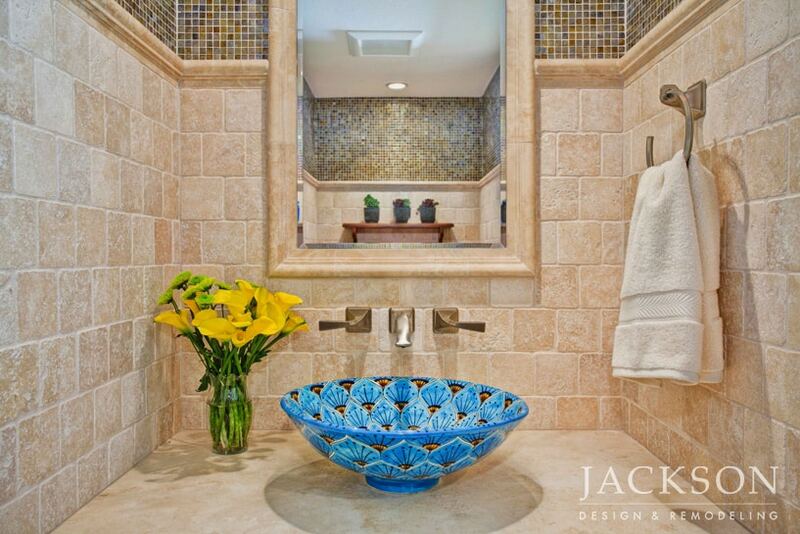 Meticulous attention to detail in craftsmanship and material selection create a memorable space. 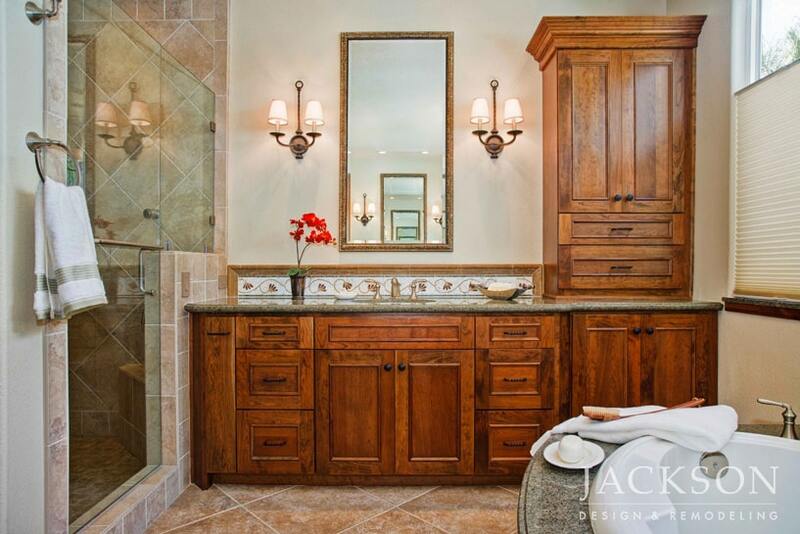 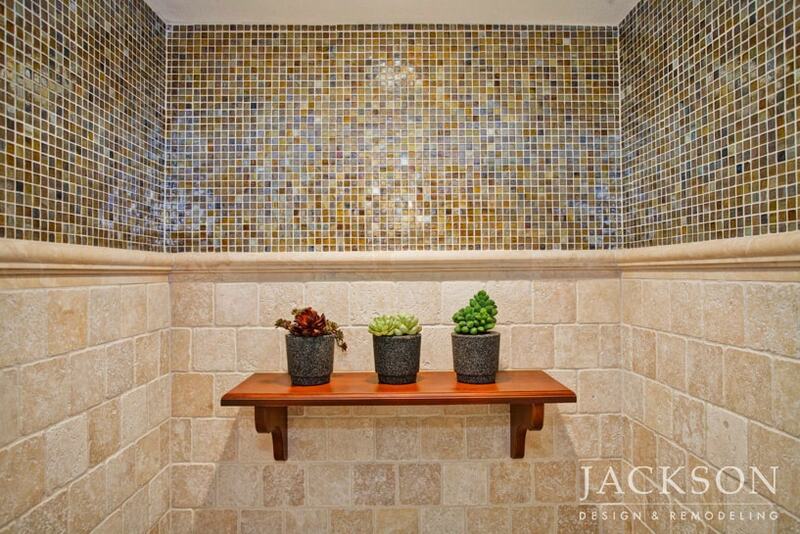 While beckoning as a spa-like sanctuary, this master bathroom also delivers solid character and function. 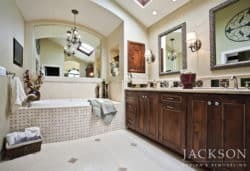 The clients wanted a luxurious master bath that was unique from their neighbors in a new home development. 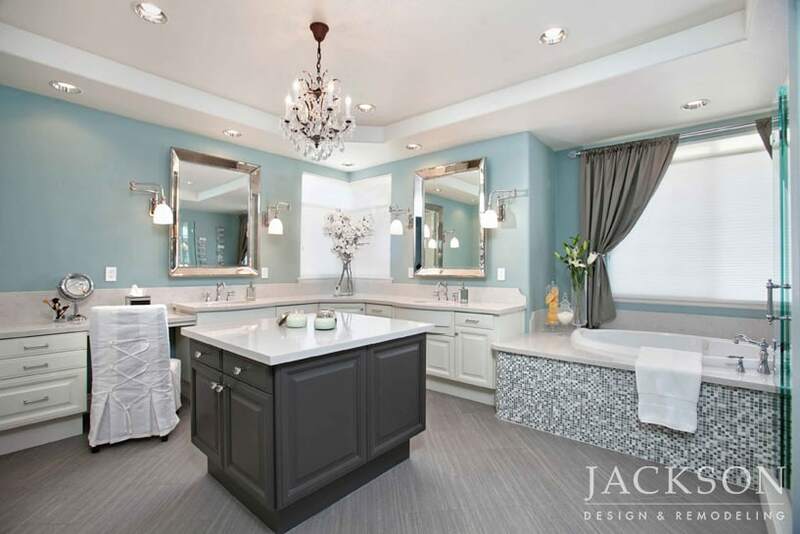 Designed for a teen daughter with a love of the ocean, this bathroom soothes with calming shades of blue and sand. 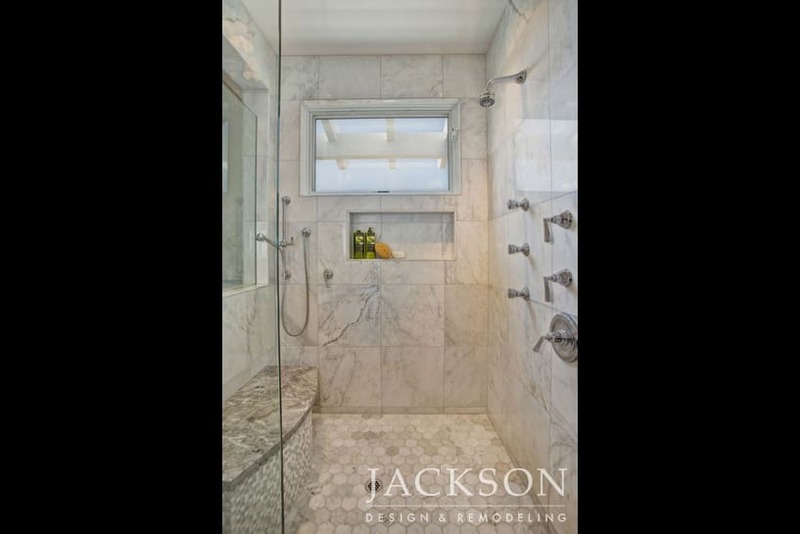 Intersecting planes of marble, tile and glass create an overall effect of relaxed refinement. 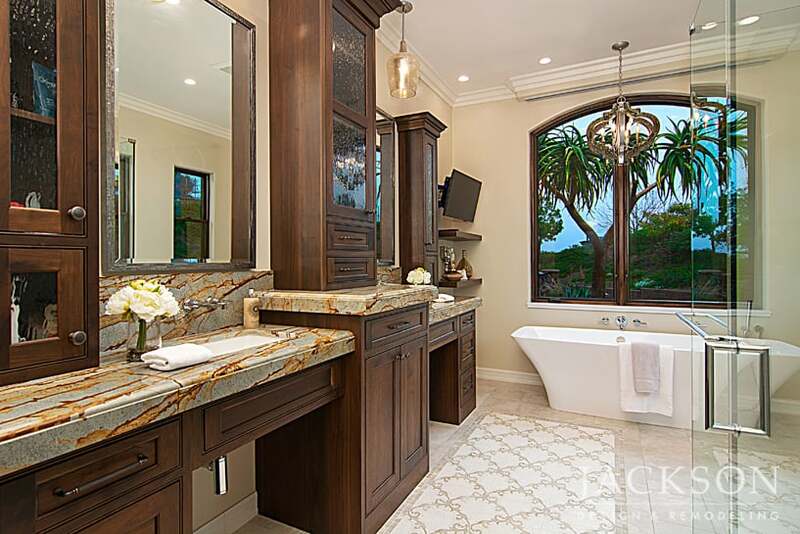 With its stunning views a central focus, this master bathroom offers a sanctuary gracefully connected to its natural surroundings. 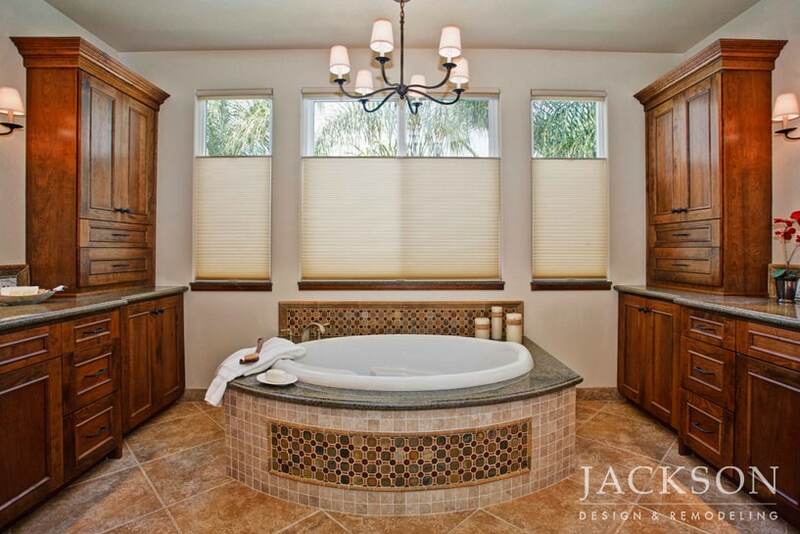 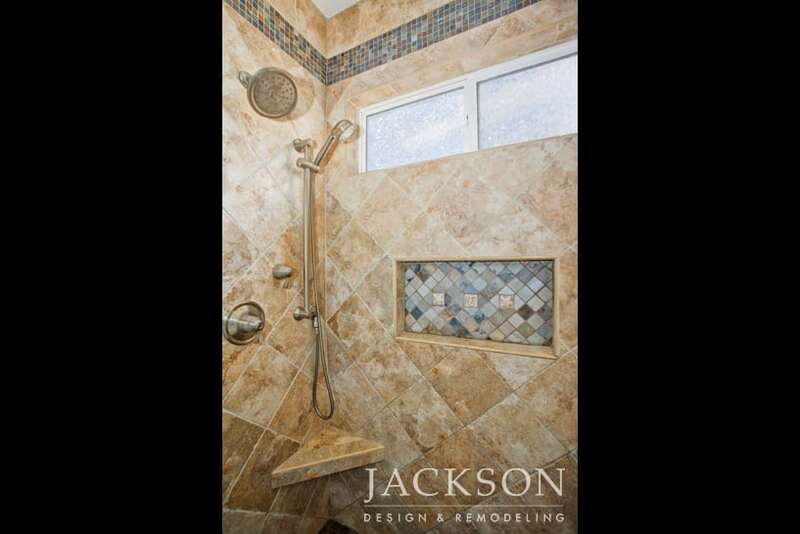 The oversized bath and shower invite lingering relaxation in a soothing environment. 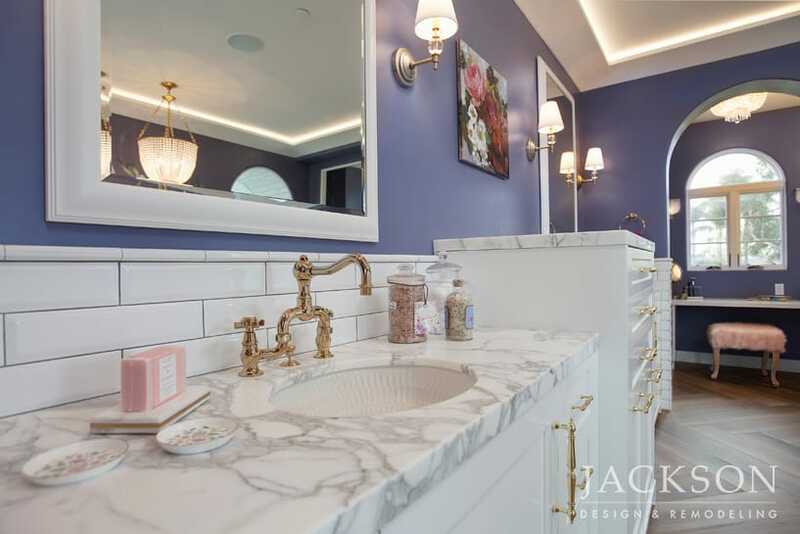 This tiny powder room makes an unforgettable impression with thoughtful design, sensuous materials and meticulous symmetry. 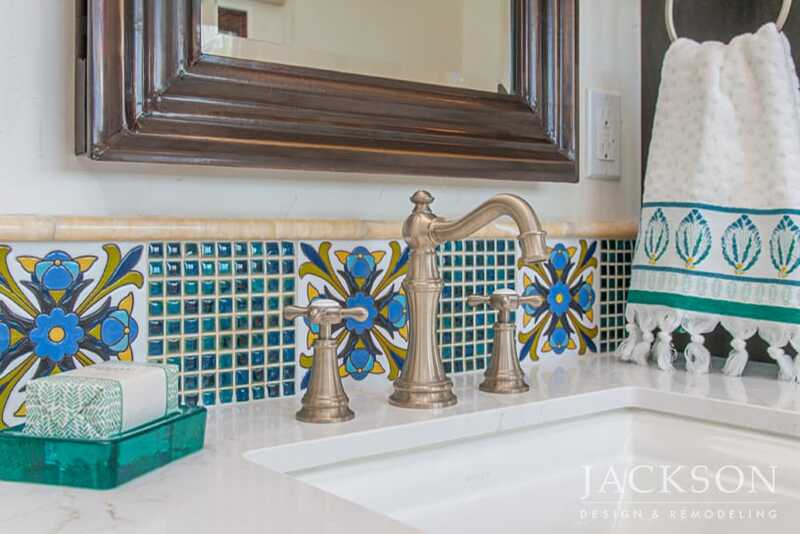 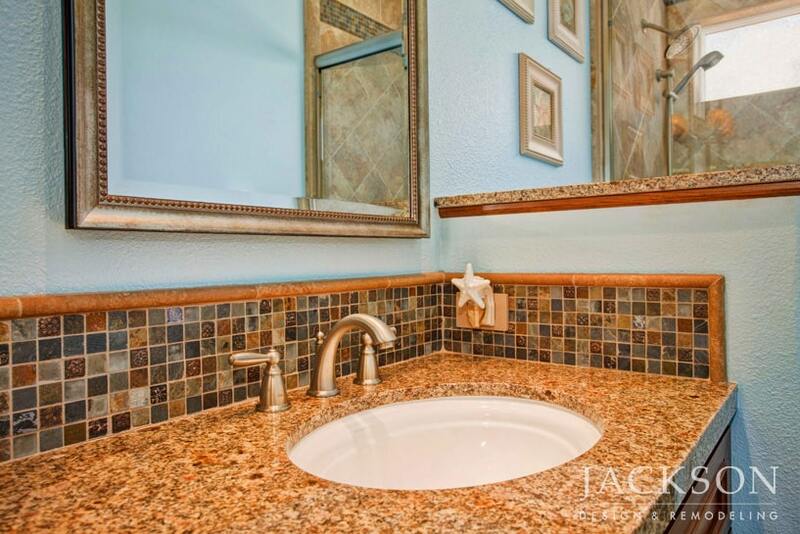 With its vibrant colors and playful placement, the sink echoes the Spanish design influence throughout the home. 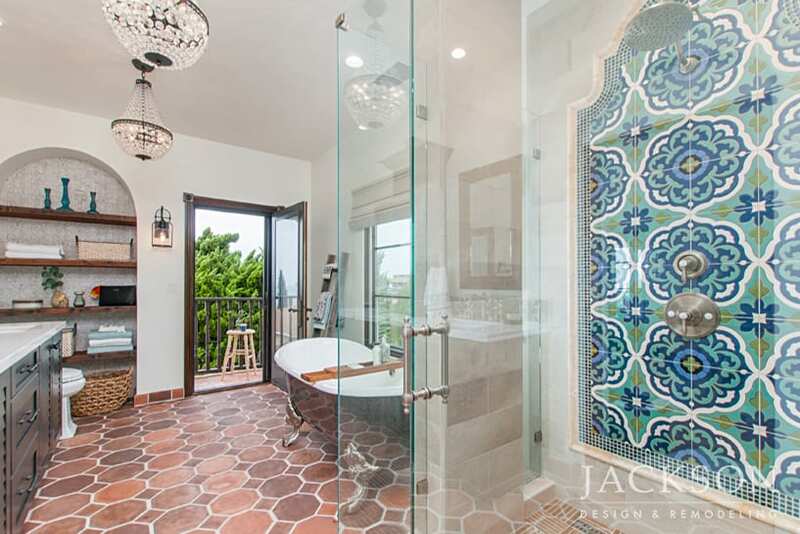 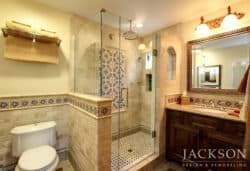 This award-winning bathroom in a 100-year old Spanish Revival style home serves dual purposes with access from the pool and a guest bedroom. 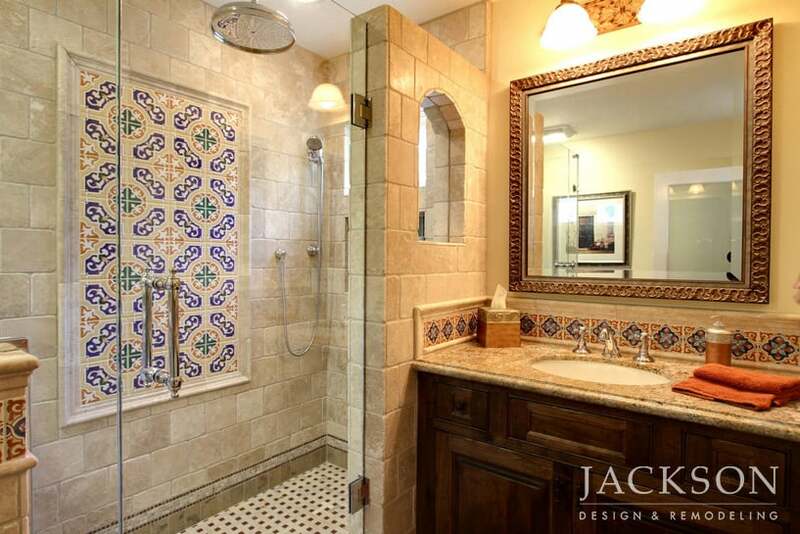 Wainscoting, vibrant mosaic tiles and a recurring arch theme emphasize the home’s historic nature. 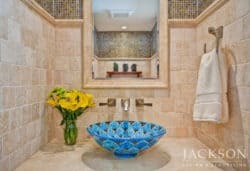 From traditional luxury to contemporary dazzle, our professional design team will guide your through your choices to the style that best expresses your unique personality.